A new study of dolphins and seals shows that despite their remarkable adaptations to aquatic life, exercising while holding their breath remains a physiological challenge for marine mammals. The study, published January 16 in Nature Communications, found a surprisingly high frequency of heart arrhythmias in bottlenose dolphins and Weddell seals during the deepest dives. The normal dive response in marine mammals has long been understood to involve a marked reduction in heart rate (called bradycardia) and other physiological changes to conserve limited oxygen reserves while the air-breathing animals are underwater. How marine mammals cope with the exertion needed to pursue prey at depth has been unclear, however, since the normal physiological response to exercise is an increase in heart rate (called tachycardia). The new study shows that these conflicting signals to the heart can lead to cardiac arrhythmias, said lead author Terrie Williams, a professor of ecology and evolutionary biology at UC Santa Cruz. 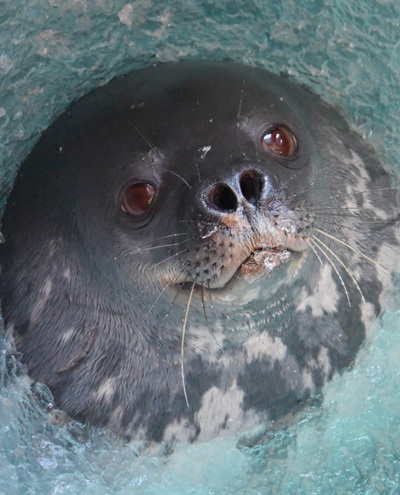 "This study changes our understanding of bradycardia in marine mammals," Williams said. "The heart is receiving conflicting signals when the animals exercise intensely at depth, which often happens when they are starting their ascent. We're not seeing lethal arrhythmias, but it is putting the heart in an unsteady state that could make it vulnerable to problems." Instead of a single level of reduced heart rate during dives, the researchers found that heart rates of diving animals varied with both depth and exercise intensity, sometimes alternating rapidly between periods of bradycardia and tachycardia. Cardiac arrhythmias occurred in more than 70 percent of deep dives. "We tend to think of marine mammals as completely adapted to life in the water. However, in terms of the dive response and heart rate, it's not a perfect system," Williams said. "Even 50 million years of evolution hasn't been able to make that basic mammalian response impervious to problems." The conflict between dive-induced bradycardia and exercise-induced tachycardia involves two different neural circuits that regulate heart rates, she said. The sympathetic nervous system stimulates the heart during exercise, whereas the parasympathetic nervous system controls the slowing of the heart rate during the dive response. The new findings have implications for efforts to understand stranding events involving deep-diving marine mammals such as beaked whales. The authors note that the behaviors associated with cardiac anomalies in this study (increased physical exertion, deep diving, and rapid ascent from depth) are the same as those involved in the flight response of beaked whales and blue whales exposed to shipping noise and mid-frequency sonars. "This study is not saying that these deep-diving animals will die if they exercise hard at depth," Williams said. "Rather, it raises questions about what happens physiologically when extreme divers are disturbed during a dive, and it needs further investigation." The study's findings may also be relevant in humans, she said. The mammalian dive response or dive reflex, though most pronounced in marine mammals, also occurs in humans and other terrestrial animals and is triggered when the face contacts cold water. A 2010 study of triathlons found that the swimming segment of cold water triathlons accounts for over 90 percent of race day deaths. "It may be that the same conflicting signals we saw in dolphins and seals are causing arrhythmias in some triathletes," Williams said. She is currently working with triathlon groups to help mitigate such problems during races. 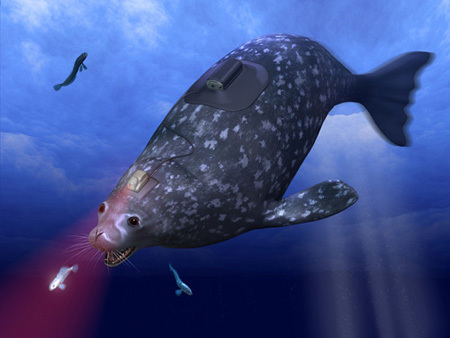 To conduct the study, the researchers developed a monitoring device to record heart rate, swimming stroke frequency, depth, and time throughout the dives of trained bottlenose dolphins diving in pools or open water, as well as free-ranging Weddell seals swimming beneath the ice in McMurdo Sound, Antarctica. Williams said the animals typically used low-intensity swimming modes as much as possible during dives. When hunting fish beneath the ice, Weddell seals alternated between easy glides and short chases in pursuit of prey. 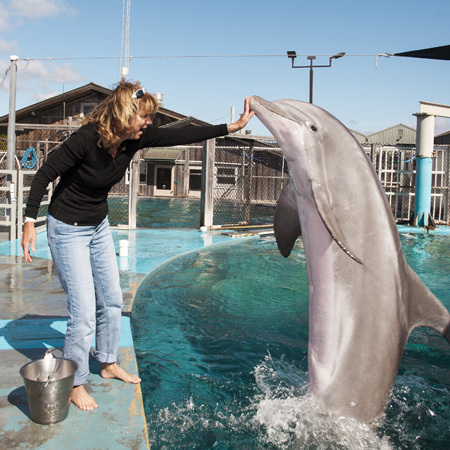 This behavior appeared to enable the marine mammals to avoid cardiac conflicts and associated arrhythmias during hunting. In addition to Williams, the study's coauthors include Tracy Kendall, Beau Richter, Shawn Noren, and Nicole Thometz at UC Santa Cruz; Lee Fuiman and Edward Farrell at the University of Texas at Austin; Patrick Berry and Andy Stamper at the Seas-Walt Disney World Resorts in Florida; Michael Shattock at St. Thomas' Hospital, London; and Randall Davis at Texas A&M University. This research was supported by grants from the Office of Naval Research and the National Science Foundation.